If you were watching the Clinton interview at regular speed and not looking for irregularities it would be easy enough to miss what NBC apparently did to protect their candidate. 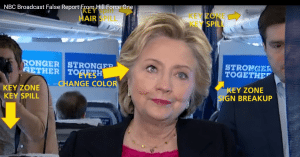 It seems that Clinton had one of her eye divergent episodes while the cameras were rolling which required a little clean up on aisle one. Dr. Noel admits he’s no technical expert so he consulted one to help with the analysis, one which he says involved a “very quick chroma key insert” which unfortunately for them and their corrupt and seriously ill candidate, produced some rather sloppy and obviously doctored results. Not only does her right eye change color in both the iris and the white, she develops an odd growth of hair at the top of her head. Her campaign signs over her left shoulder become distorted in their appearance. 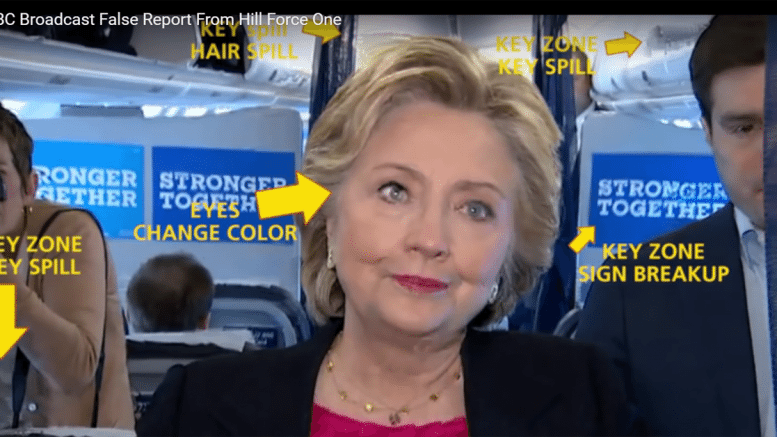 There are also two “Key zone key spills” in which a smudged appearance is apparent in an overhead compartment exterior and an area above a seat back to her right. Once the frozen frame is put back into motion, three frames after the video is put back into motion, everything returns to normal, just as it was before the emergency corrections. They also show some video from the same interview in which it appears that she is having another freeze up and bobbling head attack. Following a “loud shouting burst from reporters” and a flash of the interior lights that is common on all commercial aircraft. She certainly does have that kind of empty, black silly grin stare on her face, but it’s tough to tell sometimes with her if that’s just part of her painted on phoniness or if there is a medical incident taking place. Clearly, once again, there is a cover up going on by those who are aware of her compromised medical condition. It appears to have now penetrated to the level of “reporters,” what are now merely propagandists playing their roles.